This magnificent rainbow, high-neck bikini top with matching bottoms was the perfect center for my sun. It's a Billabong bikini that looks great on, with such fabulously soft fabric. I've always loved Billabong for it's classic style and surf wear. Plus, I believe Billabong read my mind when they made their motto "A Bikini Kinda Life." Wait until you see the new wave collection with an 80's vibe. Who else is excited the 80's are coming back? An important aspect to having fun in the sun is staying hydrated. I just love these Natural Life water reusable bottles. They benefit the environment, remind you to drink your water and provide daily quotes. As you can see for yourself, they are very optimistic. My favorite one is "Don't let anyone dull your sparkle." If we are going to be in the sunshine, we are going to need our sunscreen. You can surely "trust the bum." Sun Bum is from Cocoa Beach, Florida and their office is the porch of an old house off A1A. They care about our lives and being a good company. 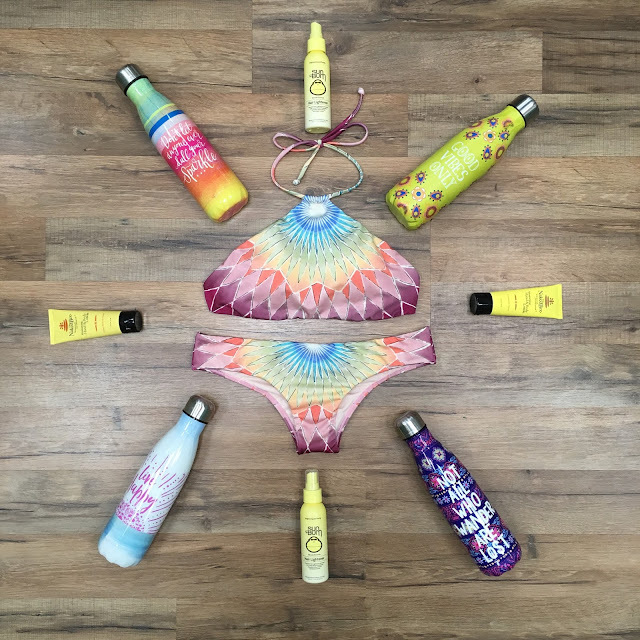 Sun Bum makes paraben free, gluten free and cruelty free products with quality ingredients. Most of us have heard about Sun Bum sunscreens but they also make hair products, cooling gels and other good for you beach necessities. I chose to showcase the hair lightener because it has pineapple, honey and lemon in it. Seems better than when I used Sun-In back in the day. My friends and I also love the "deliciously-flavored" chap-stick with SPF. SPF chap-stick is a must in the Florida sun. After you get some sun, be sure to moisturize your face, skin and lips with The Naked Bee. The Naked Bee's products have "all of the good stuff, none of the bad stuff." The hand lotion works great and smells good. The Orange Blossom Honey is a big hit based off their natural aromatherapy line and so the name of the company was born. So you see, a picture is worth 413 words...but worth so much more for your body and a life of sunshine. Stay sunny!